Locate E-136 connecting Åndalsnes with E-39 further west. Travel west along E-136 about 20 kilometer to Voll, where Måndalen runs (left) west. Turn left here, the second exit (north of the river) is the one you want. Just as you drive up a small hill, there is parking opportunities to your left on a small, short dead-end side road. This location is N62.52339, E007.39791, elevation about 95 meter. Alternatively and (much) better, note the small side road that forks right with a trail sign for Kaltinden. Take this road and drive it to an old farm and then (left) a short uphill (before the houses) where a gate says that no driving is permitted past it. There is a small arrow with a P (for parking). Park here, location N62.52666, E007.39985, elevation about 140 meter. From the trailhead described as the best one above, pass through the gate and continue up the forest road. Take a left fork in a pretty obvious location, there is a sign for Kaltinden pointing left. The forest road zig-zags uphill. Follow the main road until it ends in a fork with less use (more grass), note a trail that is again signed for Kaltinden, it starts out sort of between the forking roads. Follow this trail until it leaves the trees behind roughly where it also passes a small mountain hut. Continue uphill towards Kaltinden that lies behind the first hill-top, now visible. If your objective is to make the shortest possible route to Prosten, then exit the ridge (before it gets steep on your right side), follow the left side of broad valley and head directly towards the lowest point on the saddle between Kaltinden and Grøntinden, 1179 meter. This is perhaps the best option on your return hike, shorter and good walking terrain. 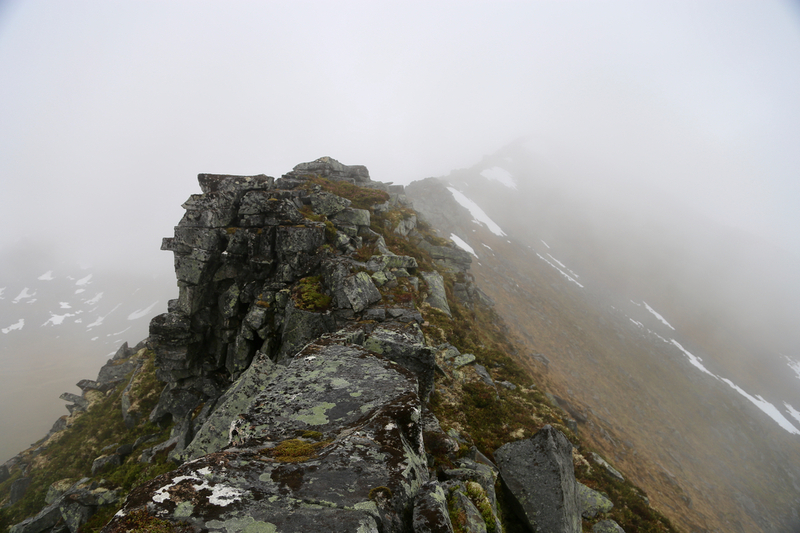 Alternatively, follow the vague path along the (broad) ridge all the way to the Kaltinden summit. 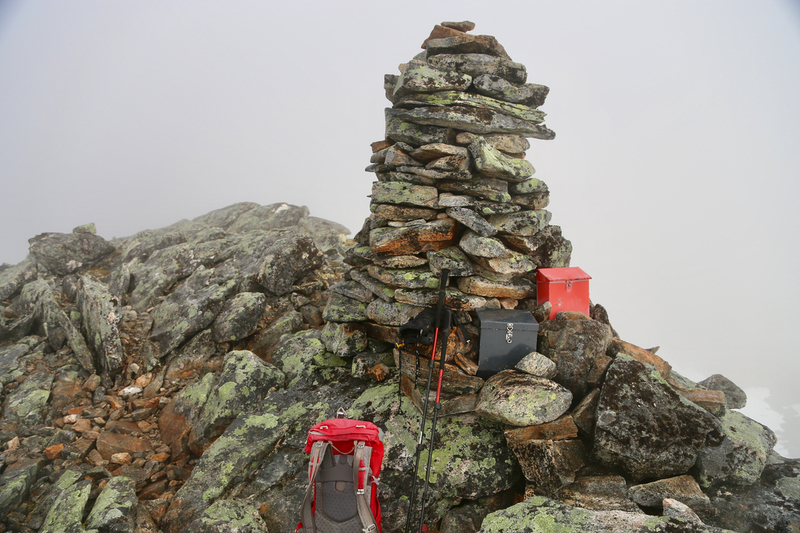 There are two summits, the first (and lower) has the bigger cairn, summit registers - clearly the top people visit. Proceed almost horizontally to the second summit having a short uphill at the last few meter. There is a smaller cairn here. 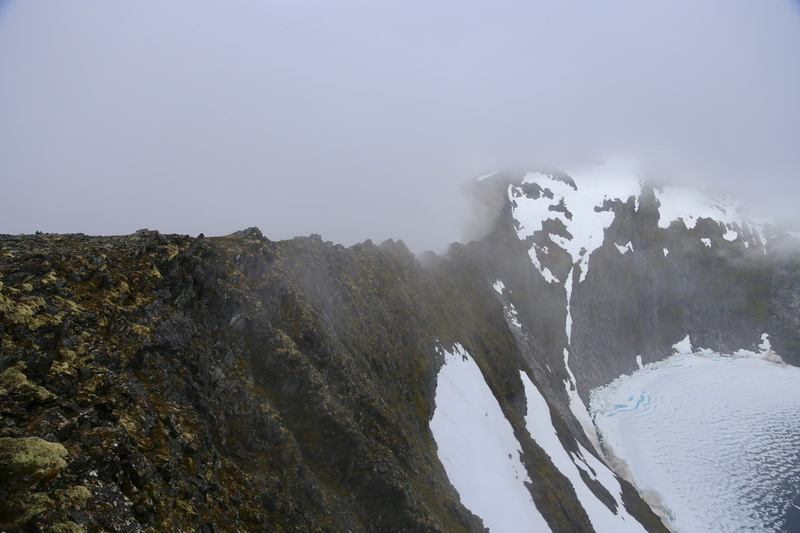 In order to continue the ridge to Prosten, return back down the final uphill and find a small trail that descends off the ridge on its north side (to your right when looking towards Prosten). Descend a little here, then traverse the slope below and regain the ridge at the low saddle between Kaltinden and Grøntinden. This slope may have snow in early summer, however it is not very steep, hopefully steps can be made (or crampons and an ice axe will be helpful). Next, ascend the ridge to Grøntinden, there are no difficulties. 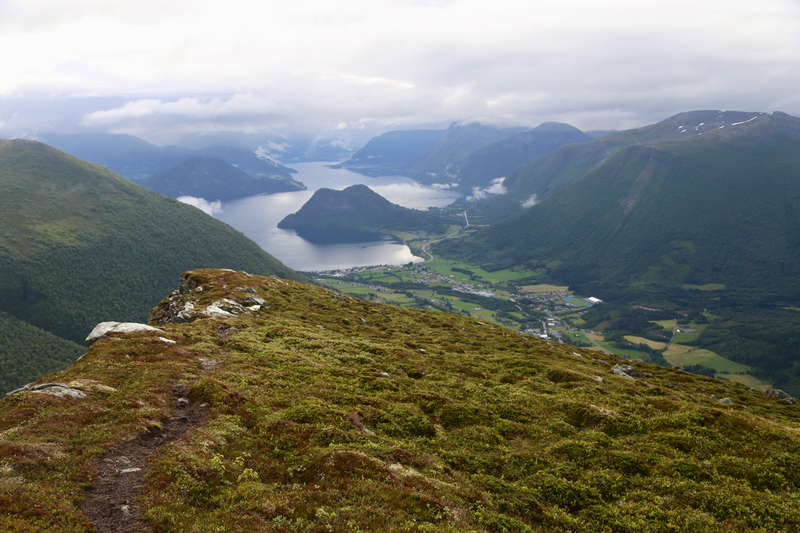 The initial descent from Grøntinden towards Prosten is a bit more rugged and the easiest route stays on the left side. Overall easy, with a couple of points where one might assign a (YDS) grade of 2+. It is best (and most fun) to stay near the top ridge all the way. When getting to the slopes of Prosten, the ridge character of the route ends. Prosten has a big, gentle face that must be ascended at the end. Staying close to the cliffs on the right hand side, may still be a good choice. 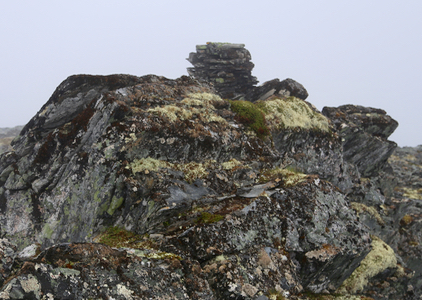 Prosten has a small cairn, a view directly down to Svartevatnet 400 meter below. 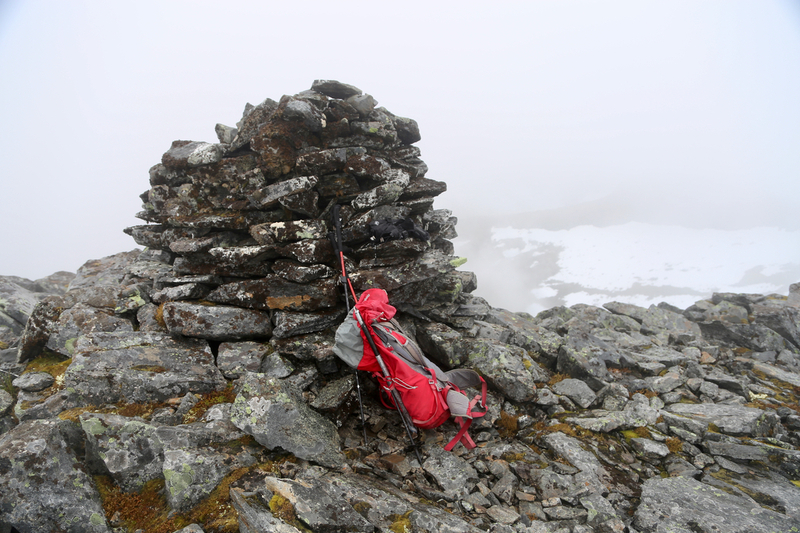 There is a slightly more exposed point near the cairn of almost the same height. An easy scramble gets you there. Attempt on November 21th. : I started out flying from Bergen to Ålesund. They obviously just had a major snowfall. I needed to dig out my rental car before I could go anywhere. Thus, the time was already 1300 when I started hiking. I carried two torches, planning to return after dark. Still, it was clear that I needed to make good progress if this trip should work out. Initially, this looked fine. The recent snow was very light and not too deep. I walked uphill on a forest road without any trouble. Higher up, I most likely made a left turn a bit early. It got me nowhere and I bushwalked up to easier terrain, then to mountain hut. There were a few more a bit further along. From here, there were no more trees. The snow was still ok. However, at around 700 meter of elevation, I ran into deeper snow. Progress slowed. I still sunk deep, sometimes clearly into holes between rocks - not good. 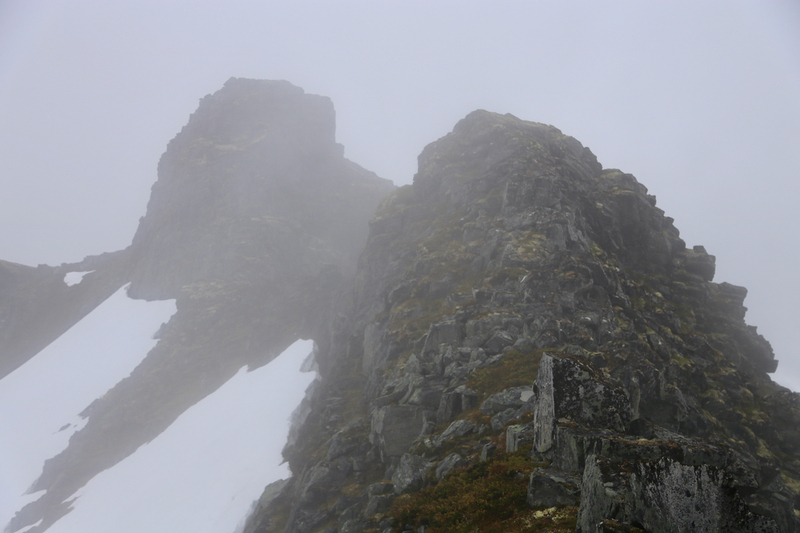 A nicely shaped peak appeared up front and I was now on a more gentle slope. I decided to stop at 860 meter of elevation. With my current speed there was no chance to reach the summit of Prosten before dark. The time was 1515. I took a short break and finished a late lunch. By 1530, I was on my way down, reaching the car as it got dark around 1630. I was back after a visit to Sunnmøre following a nice trip to Skåla. Since my next stop would be my cabin in Lillehammer, Prosten had a good location as it lies on the normal route to Åndalsnes. The fact that I had been here before and turned back added to my motivation. I slept in the car at the trailhead and after breakfast, it was time to go at 0545. How much easier without the snow. 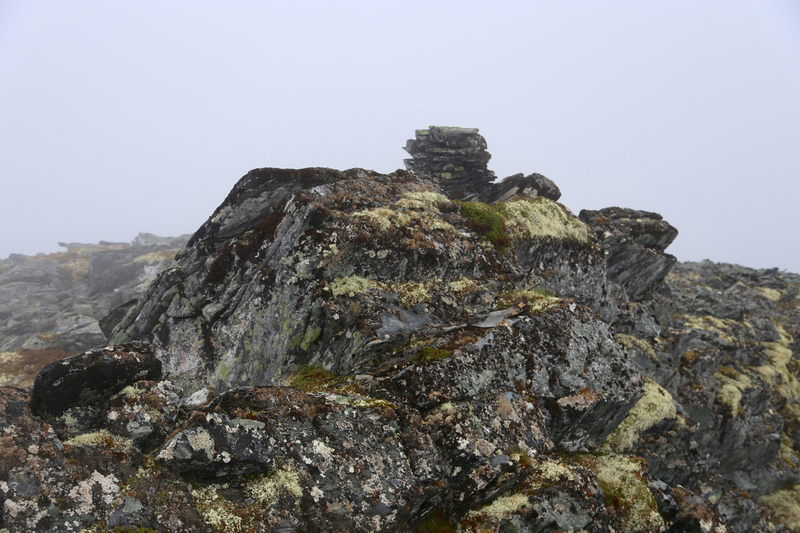 I visited the first cairn at Kaltinden at 0730, the next and highest at 0740. Descending back the first hill, it was obvious, in fact a small trail how to get off the ridge on its north side. The snow was soft enough to leave the crampons in the backpack. Back on the ridge at 0815, then Grøntinden at 0840. 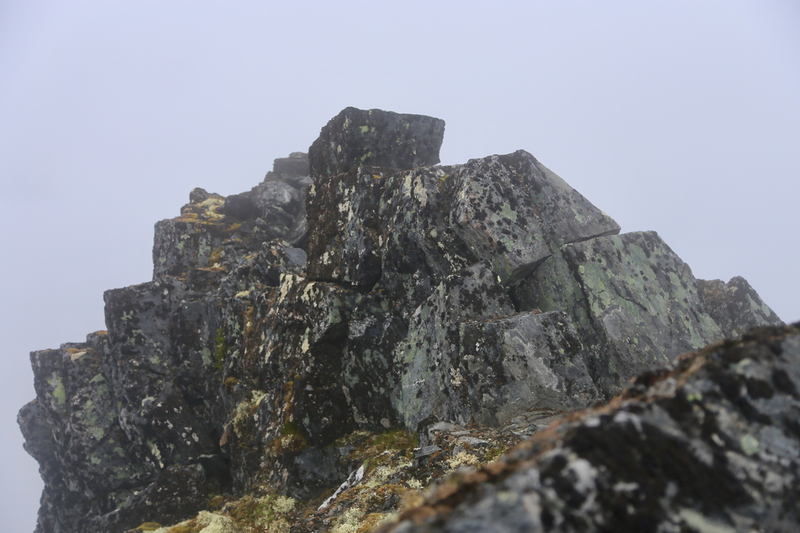 The ridge was fun despite fog and somewhat wet rocks. I did not hurry, arriving at the Prosten summit at 0930. 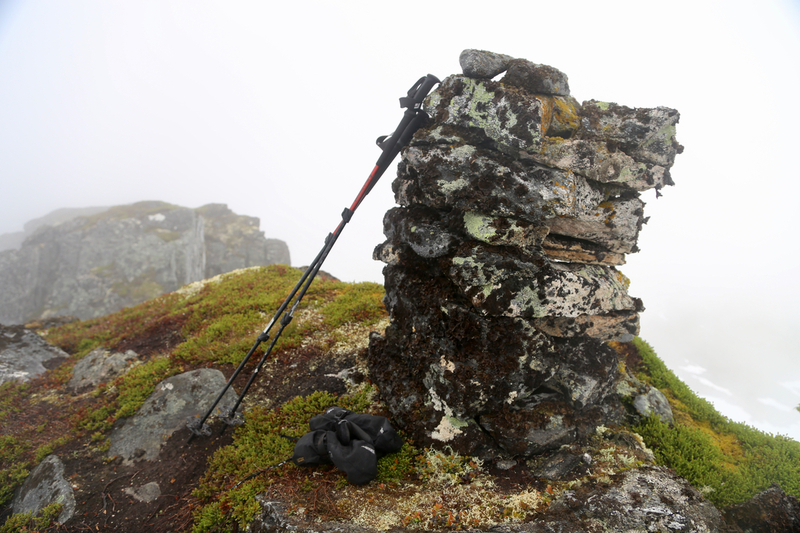 I scrambled out to the rock point that appeared equally high, a nice place to shoot a photo of the Prosten cairn. 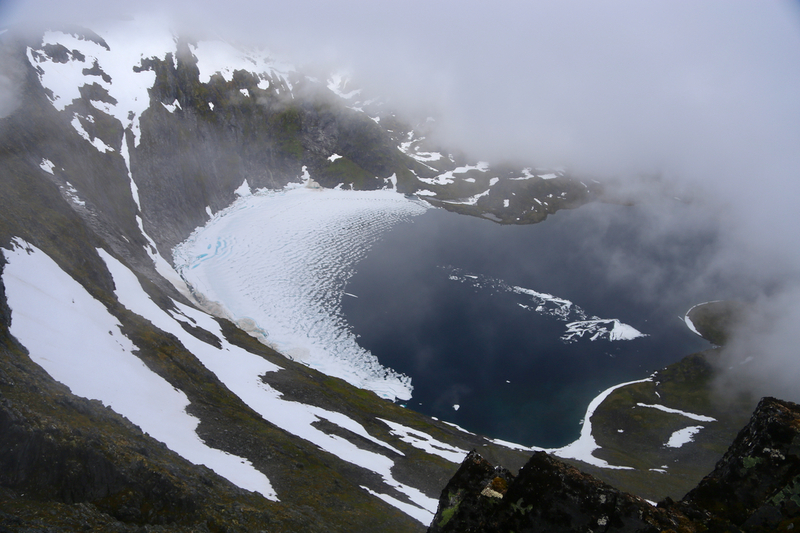 The look down to lake Svartevatnet was also impressive. The ridge running west looked interesting as well. 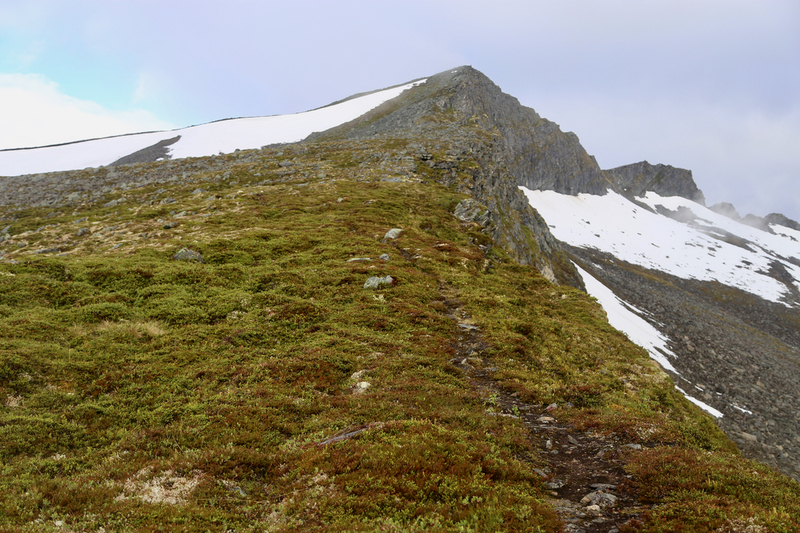 Leaving at 0945, I retraced my route all the way back to the saddle between Grøntinden and Kaltinden. Here, I descended into the broad valley below, before traversing back to my route of ascent well beyond (and below) Kaltinden. This is clearly a faster route. Descending the trail and the forest road completed a good morning climb back at the trailheaad by 1210. View back to the fjord. 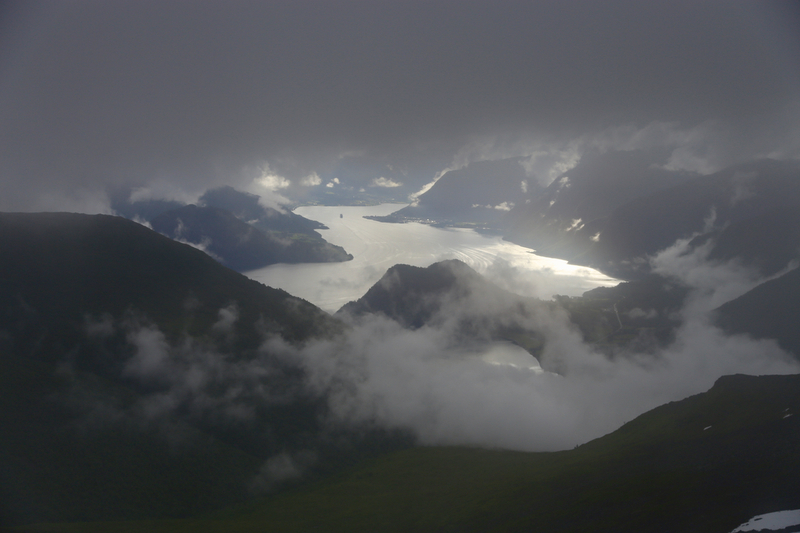 Fjord view, more clouds - fairytale.